Preheat the oven to 200 degrees F; arrange the tortillas in a single layer on an oven rack to warm them. In a small well-seasoned cast-iron or nonstick skillet, heat the oil over medium-low heat. Sprinkle a few droplets of water into the pan. If they sizzle and evaporate, the skillet is hot enough. Add the bell pepper and onion and saute until soft and fragrant, 8 minutes. Add the mushrooms and the Spice Mix and continue to saute until fragrant and the vegetables are thoroughly warmed through. Add the egg whites to the skillet. As they begin to solidify, use a rubber spatula to move them around the pan to mix with the vegetables, so that the liquid parts are exposed to the heat. When all is cooked through, season with salt and pepper. 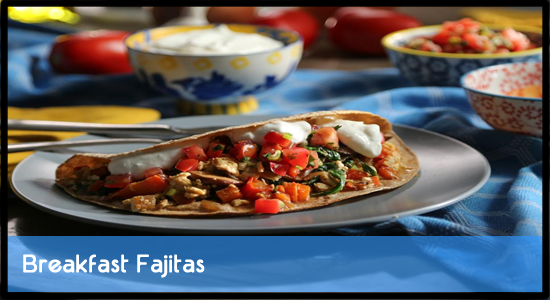 Serve straight from the skillet, spooning the fajita mixture onto the warmed tortillas. Serve with Dominic’s Salsa or hot sauce (if using), and the sour cream (if using) on the side. Combine the chili powder, cumin, garlic powder, onion powder, brown sugar, paprika, cayenne, salt, cornmeal and some black pepper in a small bowl and whisk together. Store in a small jar with a tight-fitting lid. The spice mix will keep up to 2 months. Combine the tomatoes, scallions, jalapeno, garlic, cilantro, lime juice and vinegar in a medium serving bowl. Add the salt and pepper. Stir to combine. Let sit at room temperature for 10 minutes, then stir again.